Charlotte is a barn spider about the size of a gumdrop. This educational site has links to more information and Books about Spiders additional Teacher information. This free website is a great and fun way to teach kids on good spiders and bad spiders, games, videos and even competitions. There are 37,000 different kinds of spiders out there and only 3,500 are harmless, get your children learning for free now! Get over your fear of spiders by playing Scary Spider, a real-life web simulation game of the spider. Use the mouse cursor and drag the body and legs of the spider to move it you can also add insects for the spider to indulge in! 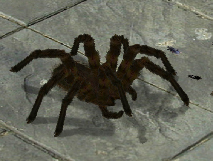 Scar Spider is as real as it gets on your bathroom floor! Check out the free spider game on the Mini Clip website. If you like the spider, you can enjoy the spider game and indulge in a little bit of adventure! All you have to do is to jump up high and eat all the bugs. Keep in mind that there is a timer, so go on a bug spree before the timer runs out! By going to this website here you will be able to play a free online spider game that you can play in your browser without having to download anything. When you have had enough of your favourite spider game they have thousands of other flash games you can play for nothing. Go this website and claim your free spider chart. Very useful if you live in an area where you get a lot of unidentifiable spiders and you do not want to look on your computer each time to identify one, you can look on your free chart.